Before you begin filling out the application, please prepare the following documents ahead of time for uploading. Download the Non-Disclosure Agreement (NDA) and Terms & Policies (T/P) and have them ready for upload. Scan a form of authentic ID and have it ready for upload. Scan a proof of your current residential address (no more than 2 months old) and have it ready for upload. Mandatory: Start first by completing the applicant questionnaire. Failure to do so will delay your application process. When creating a user ID in the registration form, the user ID must be in lower cases. The password must be at least 8 characters with at least 1 number(s), at least 1 lower case letter(s), and at least 1 upper case letter(s), at least 1 symbol (such as $, %, &, or #). 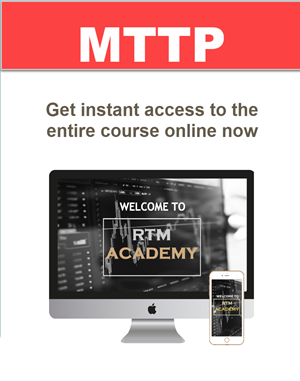 RTMA MTTP is like no other education out there. You will learn to see the market through the eyes of the Insitutiional Traders and trade along side them. The Academy is your KEY to achieve market mastery! 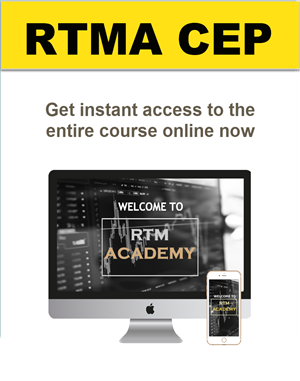 RTMA CEP is designed for prior RTM Academy students who have completed the full program. Continue Your Path to Market Mastery with Us!